They are all gone now, the combat veterans of World War One. The last one, Claude Choules, who served in the British Royal Navy, died in May this year, aged 110. The battlefields themselves are also all but gone now, or turned into carefully tended monuments. And in a couple of years we stand before the 100 year Anniversary of the outbreak of this war, a war that could very well be the most momentous event in European history since the fall of Western Rome. ”The Beauty and The Sorrow” is a book on the Great War. And it is a historical work – I am after all a historian, and I have been teaching this subject at Uppsala University – but it’s a historical work with a twist. In this book you as a reader will follow twenty real people – pretty unknown or now forgotten – among them an Australian woman who drove a lorry for the Serbian Army; an Italian soldier who ended up in a Mental Asylum; a French civil servant who never saw the front; a German school girl who grew up close to the war on the eastern borders of Germany; a South American adventurer who fought for the Turks and witnessed the Armenian genocide; a Belgian fighter pilot; a Russian nurse; an American field surgeon; a Hungarian cavalryman; a British winner of the VC etc. The main source material is diaries, letters and memoirs these persons have left behind. The book consists of short chapters, only a couple of pages long, where I try and give a picture of what one of these persons did or saw or felt during a single day. (All in all 227 chapters.) These chapters then follow one another in a simple chronological manner, starting in August 1914 and ending – no surprise there – in November 1918. I like to think of it as a sort collective diary, or twenty intersecting, intertwined biographies. But that sounds more fancy than it actually is. 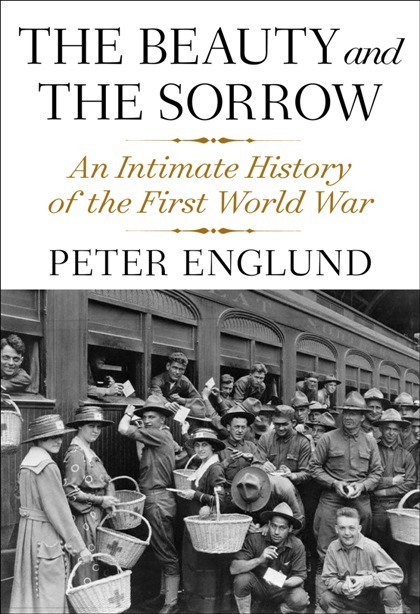 My intention with this book is not in the first place to show the Great War as an Historical Event – there are scores of books that does this, and in an admirable way: there is no grand narrative to be found here. What I have been aiming for is mainly the war as a human experience, trying to capture the bewildering and complex multiplicity of war – not least when it comes the actions and reactions of the individuals. The books was first published in Sweden, in november 2008. It has since been sold to eighteen countries, including USA, The UK, Germany, France, Italy, Spain, Russia, Poland, Holland, Denmark, South Korea, Brazil and Serbia. The US edition is published by Alfred E Knopf in New York, the UK edition by Profile Books in London. The UK edition is 532 pages long, is illustrated with 66 photos. The book is now available both in the USA and the UK and I’m glad to say it has received very favourable reviews. For instance, it was named as one of ten best books of the year in Washington Post, San Fransisco Chronicle and New York Daily News.